It is undeniably nostalgic to arrive at the end of a beloved series, but doubly so when it is a series so close to your heart. While I can't say the conclusion was as perfect as promised, the series as a whole is one that changed me greatly and I have already bought the entire set in anticipation of all my future re-reads. In case you missed them, you can read my spoiler-free reviews of Book 1 and 2 HERE and Book 3 HERE. I honestly did not expect to like Fourth Comings as much as I did. If anything, I opened this book with trepidation, fully planning to give it four stars at best, but it wound up just blowing me away. While Sloppy Firsts and Charmed Thirds remain the most life-changing of all the Jessica Darling books for me so far, I think Fourth Comings is easily the most brilliant. It isn't the one I'll re-read the most or even return to too many times, but the clues scattered throughout this book, the intelligent conversations, the maturity of Jessica...and the manner in which it all comes together and ties up with that second-to-last word? Incredible. Fourth Comings stands out as the most mature of the Jessica Darling books. In this, Jessica fully acknowledges her selfishness, her nuttiness, her insecurities, the TRUTH about her relationship with Marcus... And as someone who thrives on drawn-out drama and realistic, ambiguous endings, this was kind of perfect. It's so easy to get caught up in that magic of Jessica and Marcus but this book puts their relationship in an entirely new light - one that scrutinizes their flaws, destroying the idealistic image of these two we may have harbored before. Fourth Comings starts out with Jessica prepared to break up with Marcus, but before she can quite do so, Marcus abruptly proposes, leaving on a trip for a week and giving her those seven Marcus-free days to decide whether or not she wants to be with Marcus till death do them apart. As an individual who doesn't believe in the institution of marriage - and who was prepared to break up with her boyfriend - a marriage proposal is outrageous to Jessica. And yet, she cannot bring herself to give an outright rejection either. As Jessica embarks on her achingly normal day-to-day activities, though, she slowly comes to realize what she really wants from life - and whether Marcus really factors into that picture at all. For me, what makes Fourth Comings so phenomenal is the mere fact that by the end, everything comes together. Although dispersed with small meetings and intimate stories, all these separate journeys make a full circle, helping Jessica to become the self-assured person she is by the end of the novel. Fourth Comings continues to build upon the familial relationships Jessica sustains, both with her sister - who isn't the complete blonde airhead she once though - and her parents. I particularly loved this latter plot line as it was such a different, yet inevitable, type of relationship bred out of the follies of youth. Its contrast with the other romantic relationships in this novel, from Jessica and Marcus, Bethany and G-Money, or even Bridget and Percy, was stunning in its depth and subtlety. One of my favorite aspects of this novel, however, is the fact that we finally meet the elusive Hope Weaver. Although we don't know Hope intimately, mostly because her interactions with Jessica, though important, have been few-and-far-between, we have come to love and cherish her in our hearts. Quite simply, the ambiguity of Hope's character allows us, as the reader, to project our own ideals of the perfect best friend onto Hope - or even qualities our own best friends possess - which is what makes the interactions between Hope and Jessica in this novel so bittersweet. Not only does Jessica begin to realize that she has other friends besides Hope - that their lives don't revolve around each other anymore, but rather other subjects - but she also comes to recognize that there is still so much she doesn't know about her best friend. And although the scenes between these two could be laced with awkwardness and made me want to cry out for Jessica, I love the realistic path it took and its solid resolution as well. All in all, Fourth Comings is yet another unflinchingly honest installment from Megan McCafferty. Jessica, struggling to find a job, pay her rent, and find her place in the mesh that is NYC, is still the endearing character we first met. Although she has come a long way, she will always have so much more to go and it pains me to be so close to saying goodbye to her forever. As they say, all good things must eventually come to an end. While I wish there could be permanent AND postcard when it comes to this series, I am both excited and nervous to find out what finally happens to Marcus and Jessica. Or, you know, just WHATEVER. At this point, the only option left for me is to take every single series/trilogy/duology finale and dump it into a giant cardboard box, tightly wrapped with duct tape, haul it into my attic and then write "Do Not Open Until 2014" on it. Quite simply put, this year is just not my year for series conclusion. I have yet to read a satisfying end to a series I have stuck with and loved and while Perfect Fifths may be the best series finale I read this year, that really isn't saying a whole lot. Unfortunately. Frankly speaking, though, I was thoroughly enjoying this book until the last third emerged. While most readers found the shift into third person perspective jarring, I found it fit into the narration beautifully, switching between the thoughts of both Jessica and Marcus as these two bump into each other - literally - and later catch up through that ever-so-awkward conversation that laces the nostalgia and memories of their past. And all this was perfect. Granted, their conversation may have been a little pretentious, but it was real for these two and their time spent together was so heavily palpable with strangeness and connection. Moreover, the underlying theme of destiny and fate was beautifully interwoven into the tale - the utter inevitability of their meeting as if pre-destined by the heavens. And yet, while this book is a enjoyable novel, it is not the satisfying ending I was hoping for. A quick analogy first though, yes? I WISH OUR LOVE WAS RIGHT NOW AND FOREVER. WHATEVER. I WISH OUR LOVE WAS RIGHT NOW AND FOREVER. WHATEVER. FOREVER. For me, at any rate, Perfect Fifths was not the finality of FOREVER or WHATEVER but rather the continuation of AND. Jessica and Marcus meet in an airport and catch up and realize they still have feelings for one another and...and...and what Megan McCafferty? What happens next? After Fourth Comings, which was both realistic in terms of their relationship and moving in terms of growth, I truly expected Perfect Fifths to solidify exactly why Marcus and Jessica were perfect for each other - not just RIGHT NOW but FOREVER. Not just in this re-incarnation of Marcus Flutie, but in every re-incarnation of Marcus Flutie. And while I don't deny that the events of Perfect Fifths are utterly plausible for the romance arc between these two, it didn't wholly tie up the loose ends. Jessica and Marcus, for all I know, could break up again after this book. Since Jessica's feelings were realized in such a flimsy and rushed manner, that utter finality I wanted, that feeling that everything was going to be alright for these two no matter what hurdles came their way, was absent. And frankly speaking, I will probably be eighty with gray hairs and still wondering if these two really made it and got married and lived imperfectly ever after or not. Of course, this probably has something to do with my love of ambiguous endings (and the fact that I totally adored the ending of Fourth Comings) but I suspect much of it lies with the fault of this novel as well. Even romance aside - for this book really does read like a romantic comedy movie script in prose - what makes Jessica Darling novels so special for me is not simply the characters or their lives, but rather the lessons learned in each novel. And I think the only lesson I took away from Perfect Fifths is the utterly cheesy realization that things happen for a reason. While this is all well-and-good, I was disappointed by the lack of insight into Jessica or Marcus's adult lives. I really enjoyed seeing the people they had become, molded by their pasts and yet the same. And yet, these plot threads were hanging by a bare string for I never felt the depth of feeling Jessica harbored for the students she taught and one in particular, Sunny. I never felt the passion that Marcus had for helping construct homes in New Orleans. All I felt was the whirlwind adventure of this eighteen-hour romance and even that didn't end the way I expected it too. I don't deny that Perfect Fifths is an excellent ending for these two, I have never read this series for these two, so perhaps Perfect Fifths will be the perfect ending for readers who are more invested in seeing Marcus and Jessica wind up together. 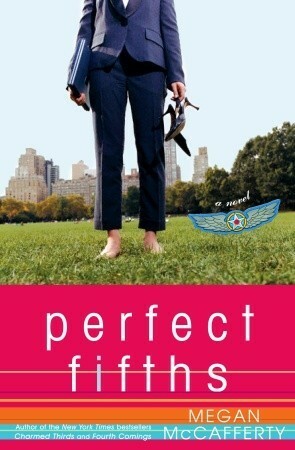 Yet, despite the fact that Perfect Fifths is my least favorite of the series, I cannot thank Megan McCafferty enough for giving me these characters and their lives. The Jessica Darling Series has changed me - profoundly - and I cannot recommend it enough. If there is one series any teenage girl should read, it is this one. Oh I'm sorry that Perfect Fifth's didn't end in the best possible way for you Keertana. It's a shame when you've enjoyed most of the series and the last book ends up being a bit of a flop. I think I heard that there was going to be two further novels, will you be reading those? I'm planning to start this series sometime next week. So I hope I end up enjoying it as much as you did. Wonderful reviews! This is a beautiful review Keertana. It truly made me want to pick up this series. I feel like I personally would enjoy the last two books of this series more so than the first ones just because of my age and stuff. Jessica seems like such a fun, snarky and yet realistic character. I'm sorry that the conclusion wasn't completely satisfying. That's one problem that I do have with a series when they don't end well. You expect the conclusion to be the most mind-blowing thing.I hope another series will end well for you this year! Everyone--seriously, EVERYONE--I know who has read these loves them. My GoodReads challenge question is "who is your fictional crush?" and Marcus Flutie comes up all the freaking time. Definitely a sign that I need to read these, I know 5 stars from you, this far into a series, this consistently, is a rare and exotic bird. Oh I'm glad that you did in an overall way enjoy these even if something was missing from that last one. I think that happens a lot when you expect so much. Still you have me convinced that I do need to at least try the first books... and especially the 4th one! Brilly reviews! I'm waiting to read the review for perfect fifths until after I finish fourth comings, but I am definitely stoked for reading the fourth installment after your high praise! And we finally get to meet Hope?! That's AWESOME! I always had a feeling that Hope and Jessica's friendship wouldn't be as perfect as it first seemed so while it's sad to hear there is some awkwardness, I'm happy to hear it's at least realistic. And I REALLY want Marcus and Jessica to work out. Sometimes, I get really frustrated with Jessica because Marcus is such a great guy and he seems to be right for her. But even then, I still love Jessica. Wonderful review! I will be reading Fourth Comings very soon and I hope I love it as much as you did. I'm so happy for the 5-stars for book four, but now I am really worried about book five. I didn't read that review because I don't want to ruin it/spoil myself, but it seems to be the least-liked one out of the whole series. That said: I <3 Marcus forever. I did not like the fourth novel and I don't really remember why. I think it just seemed to be too much squeezed into one novel. It seemed very rushed and I wanted it to spend more time on events that I considered important. I loved your review. So concise and crispy. AHA. After the 5th book, I couldn't pin point what it was about it that I didn't ABSOLUTELY LOVE but now I get it! But I really did love this series (THANK YOU for convincing me to read it!) and now I'm going to force it to all of my friends! I did not read your reviews because I have only read the first two books, but I checked out the ratings. So I guess I'm warned that Fifth Helpings may not live up to expectations. I'm really not wanting the series to end so I've been reading them slowly and far between! I'm afraid I might psych myself out to read these this summer if I start looking at your reviews. Sometimes if I think too far ahead in a series it affects my enjoyment of the earlier books. But it appears that you liked these books overall, which says a lot. I'll be back to discuss when I make my way through them. I'm ready to no longer feel like I'm missing out on something huge b/c I haven't met Jessica or Marcus yet. Did you know you can shorten your long urls with AdFly and get $$$$$$ for every visitor to your shortened links.